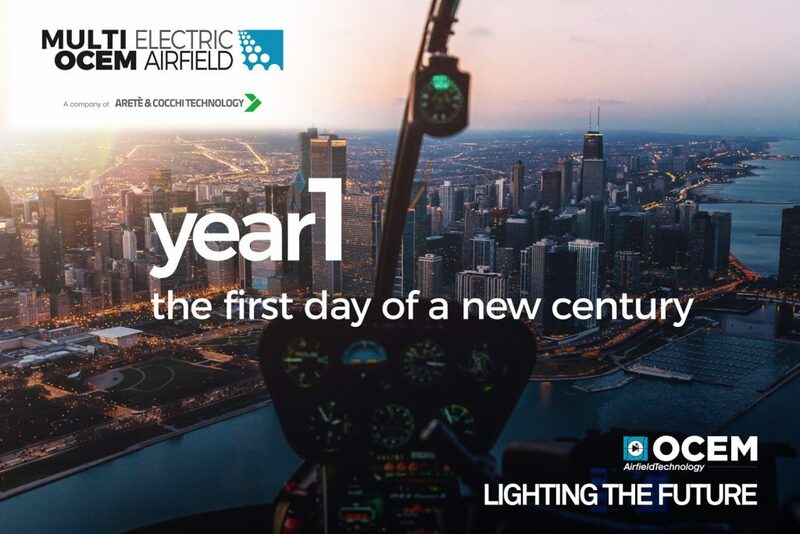 Multi Electric is kicking off its next century in airfield ground lighting with a major rebranding effort. The new company identity, Multi Electric-OCEM Airfield, reflects a closer relationship with its parent company, the OCEM Airfield Technology Group, and its renewed investments in research and development. Gino Cocchi – chairman of the Aretè & Cocchi Technology group – said, “The name was chosen to represent the best of Italian design and engineering expertise combined with a century of American manufacturing and business know-how”. Founded in February of 1917, Multi Electric Mfg. started out in wiring components and street lighting. When commercial aviation took off in the 1960s, the company became one of the first American AGL producers. Multi was acquired by OCEM in 1999. Together they were among the first businesses in the world to incorporate long-lasting, energy efficient LED technology into their raised and inset lighting signals. Since then, Multi Electric-OCEM Airfield has helped hundreds of airports make the switch to LED. Thus, the new technological offer has meant lower carbon emissions, power consumption and operating costs. On the other hand, LED offers higher color performance, and high reliability and life duration. In particular, LED lasts up to 25 times longer than incandescent lighting signals, according to Transportation Research Board estimates. The agency has found that LED signals have an average lifespan of 150,000 hours compared to just 6,000 hours maximum for incandescent lights. The OCEM group also includes Augier, a French company specializing in power transport since 1954. These affiliations allow the OCEM Group to provide fully integrated AGL solutions: Lighting Signals, Telecontrol Systems and Constant Current Regulators. To find out which Multi solution is right for you, contact a sales representative today.